You have added Aria Crochet Lace Mesh Illusion Neckline Dress in Scarlet Red into shopping cart. The bold crochet lace on this dress makes it a stunning and sophisticated look. We also love the mesh illusion neckline that is perfect for when you want to look beautiful without feeling overexposed. The Aria Crochet Lace Mesh Illusion Neckline Dress is fully lined, except at the neckline, which is semi-sheer. It is made of a bold floral crochet lace and it has a classic fitted pencil cut. 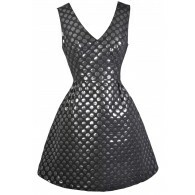 Light padding at the bust gives support and structure to this dress. Semi-sheer mesh makes up the illusion neckline and continues around to the back of the dress. A hidden back zipper completes this look. The Aria Crochet Lace Mesh Illusion Neckline Dress would look nice paired with pumps or strappy heels. This would be a cute dress to wear to a wedding, cocktail party, or summer gathering. Details: Fully lined below bust. Lightly padded bust. Hidden back zipper. 100% polyester. Contrast: 92% polyester, 8% spandex. Lining: 100% polyester. Dry clean only. Small measurements: Length from top of shoulder to hemline: 33". Bust: 32". You have added Aria Crochet Lace Mesh Illusion Neckline Dress in Scarlet Red into Wishlist. You have added Aria Crochet Lace Mesh Illusion Neckline Dress in Scarlet Red for Stock Notification. You have set Aria Crochet Lace Mesh Illusion Neckline Dress in Scarlet Red as a loved product. You have removed Aria Crochet Lace Mesh Illusion Neckline Dress in Scarlet Red as a loved product.